There might have been a time, this WAS true. Not anymore. Your contractor (if he/she is any good) is crazy busy. They’re struggling to keep up with their day job. They’re meeting customers. They’re bidding jobs. They’re lining up subcontractors. They’re buying materials. They’re trying to hire people and deal with employee issues. Somewhere in between all these duties they’ll try to do a little research for you. When you tell most contractors, I want a glass block shower (which they don’t do often), they’ll like to try to talk you out of it. They’ll say, “You don’t really want that, do you?” Then they’ll dish up every excuse in the book why it can’t (or shouldn’t) be done. Let’s face it. It’s a pain in their rear. It’s out of their norm. If they do a little research for you, feel lucky. 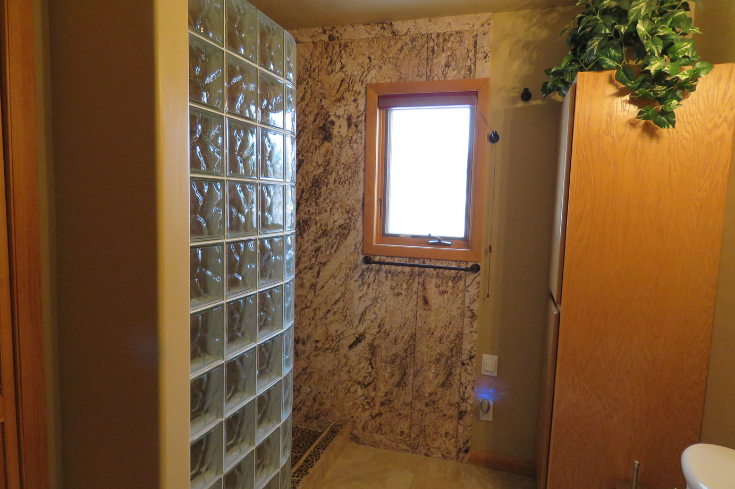 If you want a glass block shower you can’t leave it solely to your contractor to figure everything out. Follow the advice of Geri of Las Vegas Nevada and Tami in Laguna Hills California. These two homeowners took the bull by the horns and researched products and processes to make their showers happen. Read their stories by clicking the links under the finished pictures of their jobs. Take initiative. Read about the best systems to prefabricate and install glass blocks today (more about this in myth 4 below). Learn about new patterns, styles and design trends. 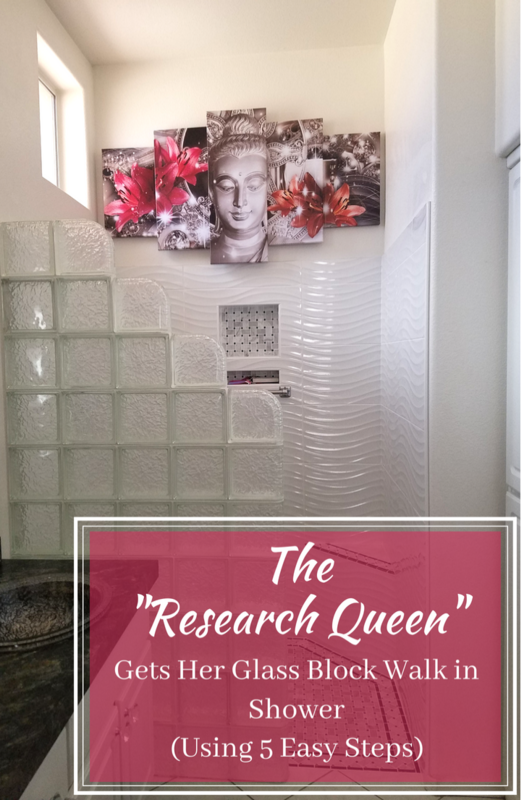 See how to design, build and (finally) enjoy the glass block walk in shower you wanted. Old. Clunky. Institutional. Glass blocks? Yes – some glass blocks are old, clunky and institutional. After all this product was invented in 1882. 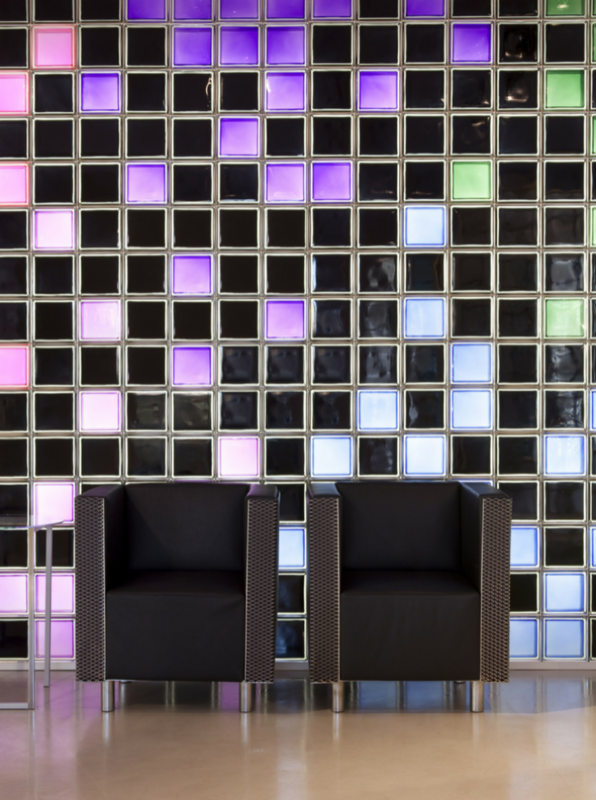 However, new fashion-forward glass blocks (like the ones shown below from the ‘diversity series’) are hot. They’re being used in chic-chic boutique hotels and Coach department stores. Glass block doesn’t have a style and product selection problem. The glass block industry has an effective marketing problem. There are limited efforts to promote it’s use in the residential market, so this ‘glass-block-is-behind-the-times’ myth perpetuates itself (fueled by contractors who don’t want to work with an unknown material). So, just because some ‘not-so-high-fashioned-himself’ contractor (or ‘gon-tractror’ as the Italian in me would say say), tells you it’s out of style, doesn’t mean he/she knows what they’re talking about. Do your research on glass block styles. Come to your own conclusion. You know what you like. Get it. Today, you’ll find ‘Modern Minimalist’ glass blocks and fun styles with beach images and waves. This structural building block has cool options which have been kept a deep, dark secret for years. Unlock the mystery of stylish glass blocks. Unfortunately, I get this call all the time. Here’s 2 practical problems I (and my team) deal with if someone has installed the shower pan before thinking through the size and shape of the glass block wall. Problem #1 – The curved glass block wall they want won’t fit on their base – Most people prefer a walk-in design. They want to blow up cleaning the bottom of nasty framed shower doors. 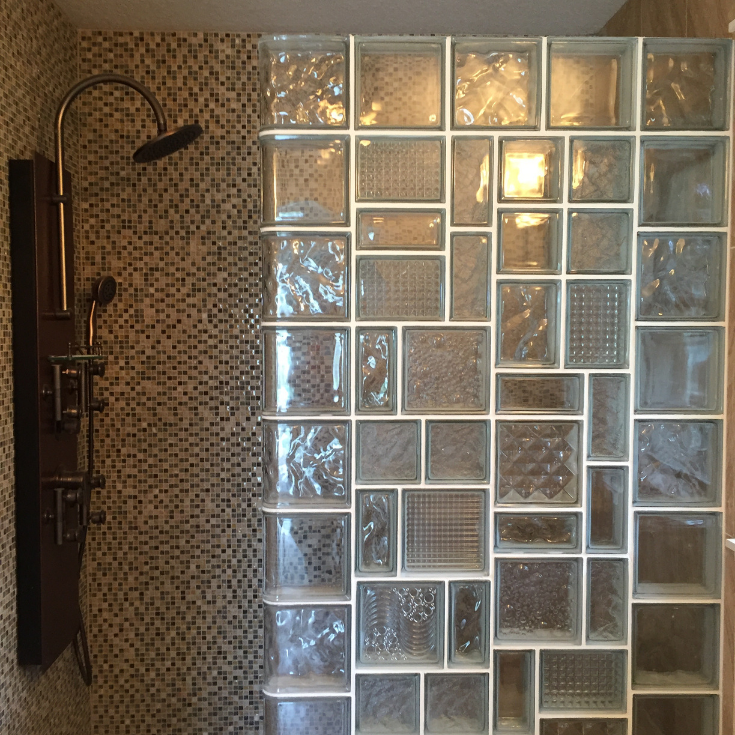 Most walk-in glass block showers have curved walls (which bounce the water back to the drain). The problem is if the shower base is already built with a straight curb (or a curved curb which won’t follow the shape of the manufactured glass block sizes) you’ve got a problem. 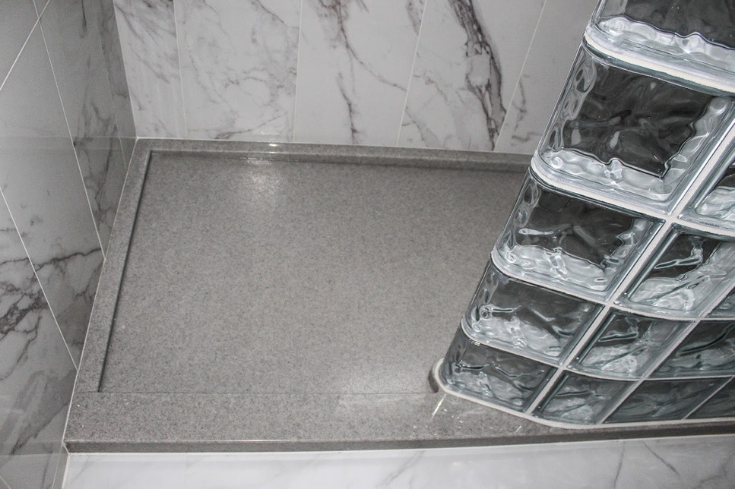 Problem #2 – The glass block wall is wider than the width of the shower curb – This problem shows itself most often with cheap fiberglass pan which can have curb widths as small as 2 ½” wide. They’ll be too narrow to fit even the thinnest glass blocks (which are 3 1/8” wide). Your shower pan is the foundation of your shower. 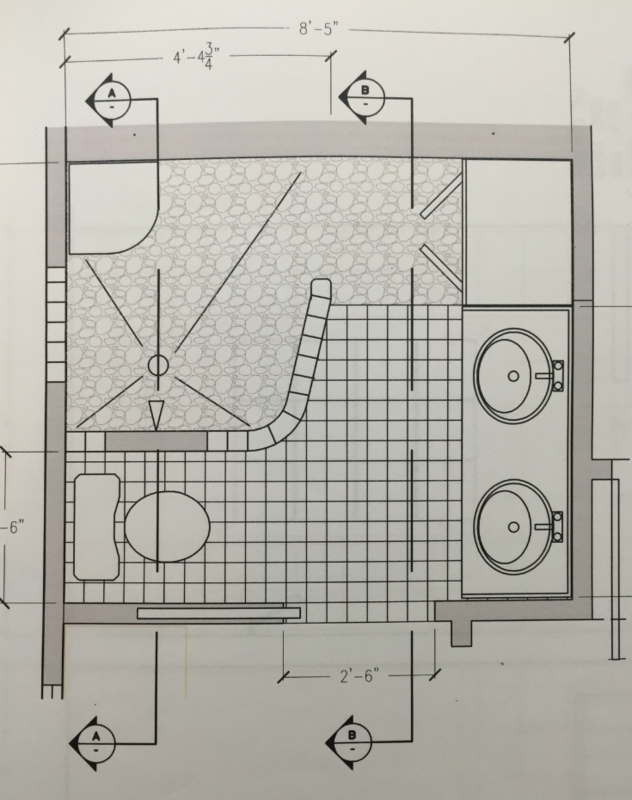 However, since glass blocks can’t be cut their shape, size and thickness need to ‘drive the bus’ on the shower pan design. So, here’s 3 steps to make sure your block wall ‘plays well’ with your shower pan. Step 1) Sketch the glass block shower wall design you want. Don’t worry about your sketch being fancy. Just scribble it on a piece of notebook paper with an approximate size for the pan. 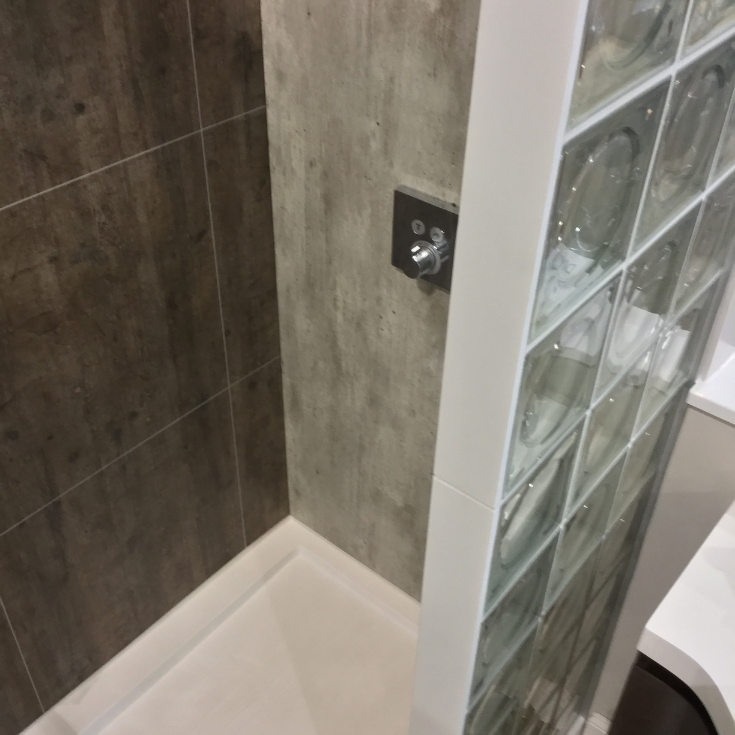 Step 2) Email (or bring in) your design to a glass block shower wall designer who sell ‘kits’ (these kits include a prefabricated glass block wall and the shower base). Step 3) Have the glass block shower designer use layout cards to create a design which is based on actual block sizes. If you like the design, and the price works – buy the shower kit (base + prefab walls). This way you won’t have to sweat if these 2 elements ‘play well’ together. It’s important to know with the shower pans you’ll have 2 choices. There’s a custom ready for tile pan if you love tile. If you don’t want a lot of joints, choose a ready for tile pan using a linear drain so you can use large format tiles. Second if you HATE, HATE, HATE tile (I’m in this category), blow up the tile-ready pan and go for a solid surface shower base. They come in 51 sizes and can be designed to fit any block configuration. Here’s 2 facts you need to know. 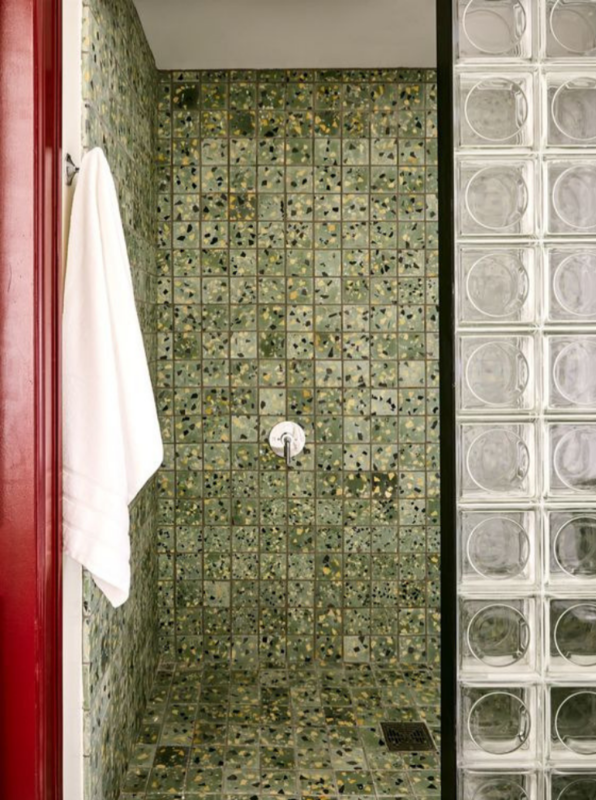 Fact #1 – Glass block showers USED TO BE a pain in the a** to install. You had to find some crusty, old mason contractor to do the job (if he would agree to do it for you). He needed mortar, sand, anchors and reinforcing wire (which in some cases rusted down the road. I’ve seen this. It isn’t pretty). He laid the blocks unit by unit. It was time consuming. It was expensive. It was painful. 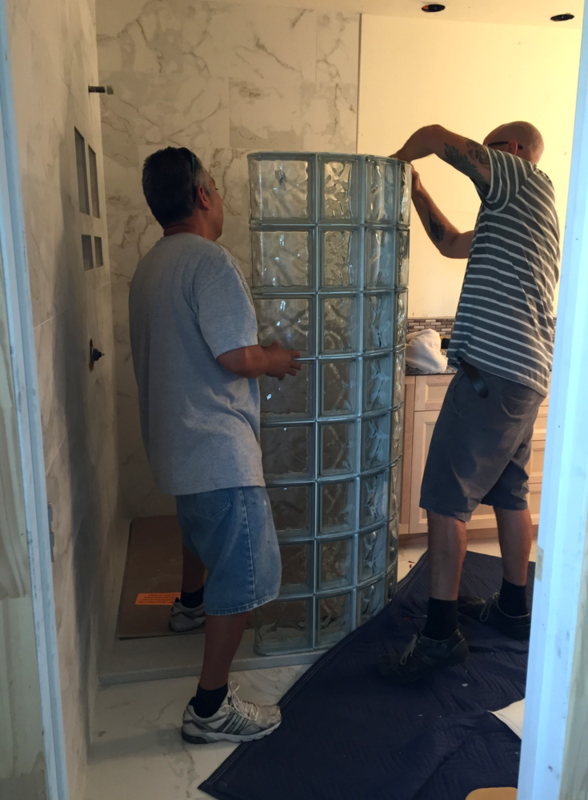 Fact #2 – Glass block showers ARE NO LONGER a pain in the a** to install. Even if you’re a DIY’er (or a pro contractors who hasn’t done this project before), the prefabricated ‘Lego-block construction’ installation with glass blocks is easy-peasy-lemon-squeezy (as a guy I work with likes to say). The ‘old-style’ block by block method with a mason is seldom used today. Prefab wall sections (which stack on top one another like Lego blocks) are simple to install. You take one section, anchor it to the wall. Put down silicone, then lay the next section on top of it. When all the sections are set, you’ll field grout the wall (we recommend first-timers do it the next day). This straightforward process works for straight, angled or curved glass block walls. Most people love tile. Most people HATE grout. 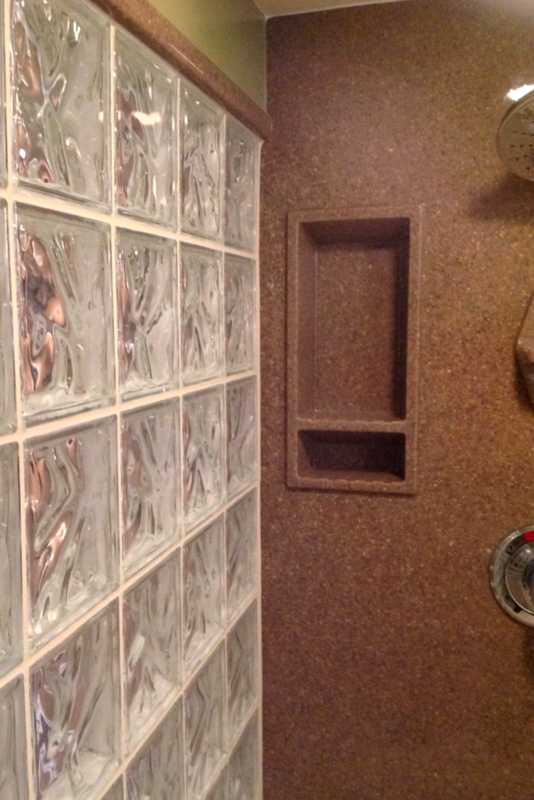 Most glass block showers built ‘back-in-the-day’ had tile surround walls. There’s nothing wrong with this approach except you’ll want to remember it’s time-consuming to maintain grouted shower wall surrounds. 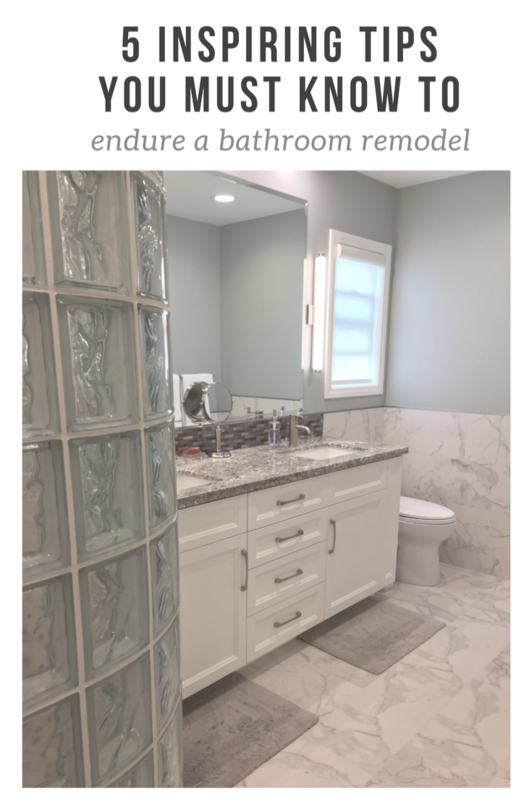 If you want to eliminate tile (and the scrubbing on your hands and knees, or trips from the Grout Doctor) you should consider these 4 options. These 2’ x 8’ x 3/8” thick laminated panels click, lock and seal together. They come in fun interior design styles like Modern Minimalist, Transitional, Contemporary and even Modern Farmhouse. They’re simple to install – even with one person. They’re sturdy, yet only weigh 26 lbs./panel. This one piece, 3/8” thick panels are built like a stone (OK – I guess it’s because they are a stone!). They come in 51 colors (which can match the glass block shower pan) in matte and gloss finishes (note: I’d recommend a matte finish because it’s more contemporary and doesn’t show spotting). The one thing I’ll warn you about is you’d better eat your Wheaties (and have help) installing them. A 60” x 96” panel will weigh 130 lbs. These 5/32” thick panels come in fun, bright colors which look like back-painted glass (but at a lower price than that option). They’re glossy surface makes them pop. They’re not a ‘cheap-date,’ but they are waaaaay cool. These ¼” thick panels (which are digitally printed with a waterproof PVC backing) are super-simple to install and have an elegant look. So, tell me (and be honest). 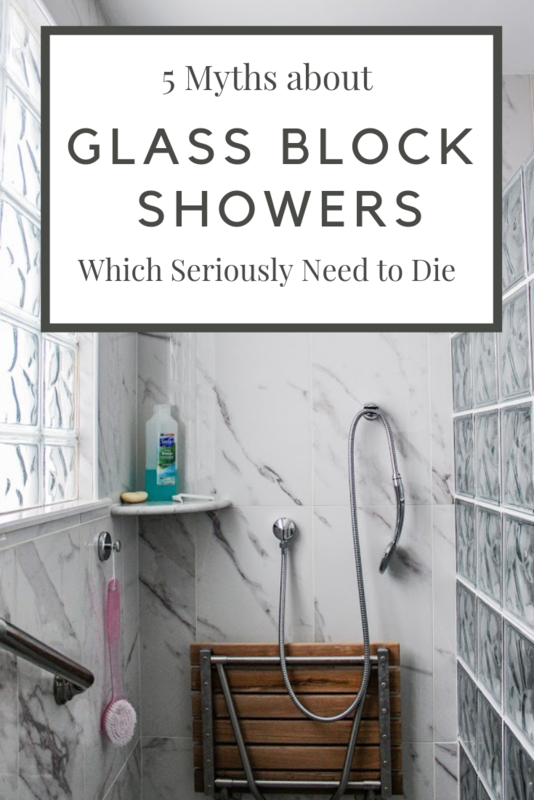 Did I (a) nail the dumb myths you’ve heard about glass block showers or (b) need to get my head examined or (c) you’ve got more stupid glass block myths to add to the list? In all seriousness, I hope knowing more truths about glass block shower walls will put you on the right path for a successful project. If you need help designing, installing or getting wholesale-direct pricing on a glass block shower kit (a shower base and wall) call me (or my team) at the numbers below. We’d be honored to help you. 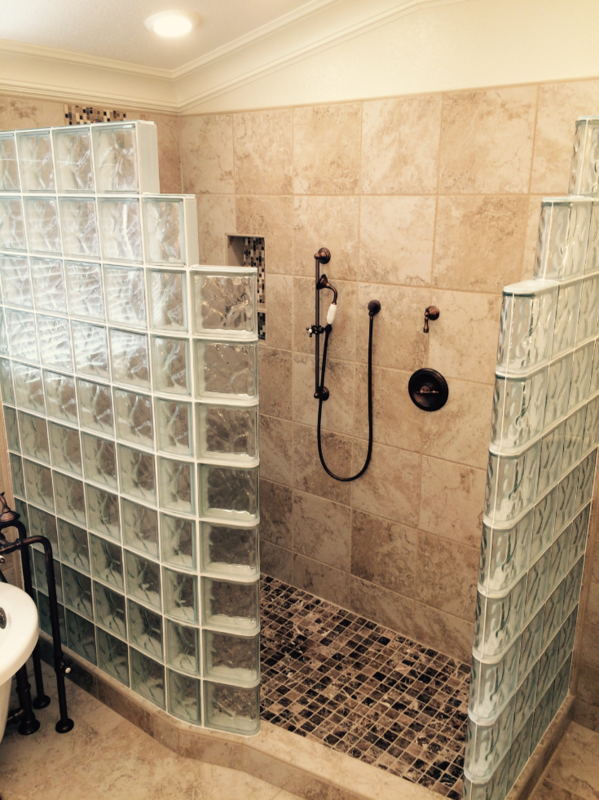 For more information about a glass block shower system contact Innovate Building Solutions at 877-668-5888. 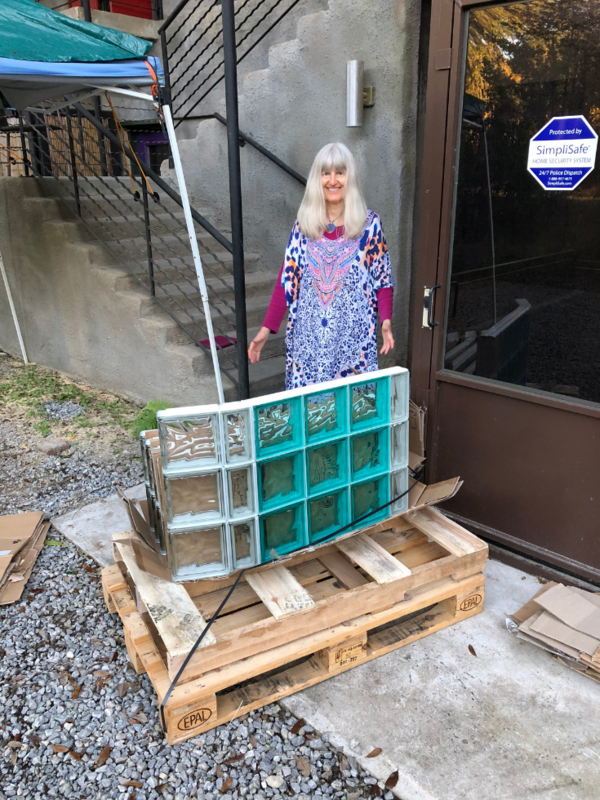 To use glass blocks in a remodeling project call Cleveland Design and Remodeling at 216-658-1270 or in Columbus The Bath Doctor at 614-252-7294. Loved the insight and totally agree. I love the aesthetic. I would like to learn more about the appropriate way to design a glass block shower. I’m presuming its all about the specifications of whichever block you choose, but I haven’t done any research yet.